The Fujifilm IS-Pro is sensitive to ultraviolet, visible, and infrared light. The wavelengths covered by its sensor is around 380nm to 1000nm. To check the effects of using a UV filter to block UV light, while still allowing UV and IR light through to the sensor, I decided to do a quick test. I also tested various other filters I have on the camera as well. I don't have any colour filters, other than a Cokin sunset filter, so I couldn't test those. Below are the test photos, you can download the RAW file for each photo if you want to check differences yourself by clicking the filename. Resolution wise, the full spectrum and UV-Vis photos are someway behind the visible light only and IR only photos. I would say the IR only photo seems to have a bit more detail than the Visible only photo. In terms of chromatic aberration, I would say the Infrared only photo looks the best again, followed by the Visible only, and then all the others being equal. Since the Infrared image is virtually monochromatic, it's not too surprising that any CA is very hard to spot. What else can I say from this test? The Redhancer doesn't seem to make a lot of difference, though does make the landscape slightly more red than in the other photos. Likewise, the polarizer seems to do it's job properly on the full spectrum camera. 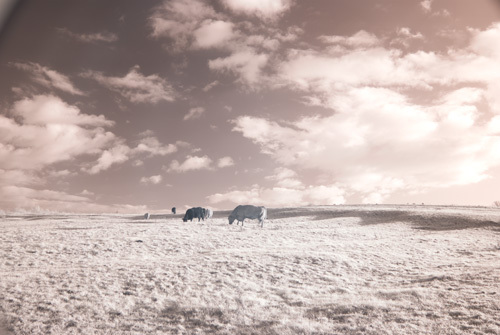 After doing the above test, I wondered how well the polarizer would work for IR photos. Here are a couple of test photos, with and without the polarizer. 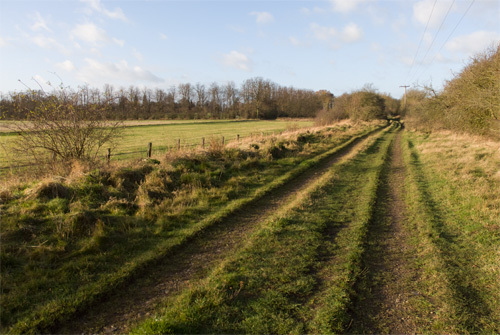 I have adjusted the exposure slider in ACR for each image so that the images are roughly exposed similarly. 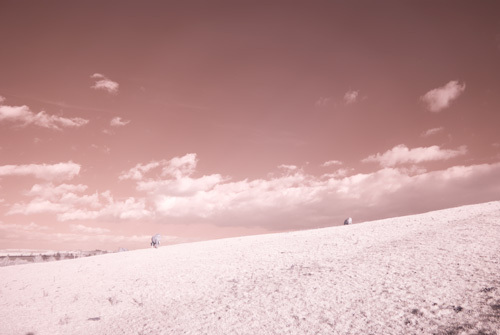 I also took one with the Redhancer and IR filter (no polarizer) to see if that made any difference. 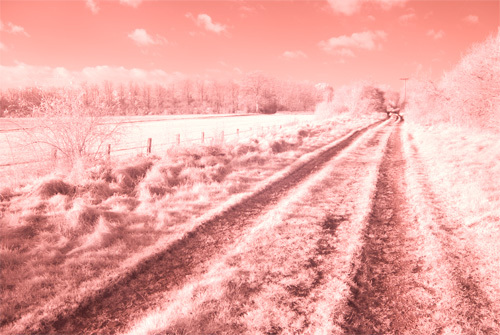 Since the Redhancer is meant to enhance red tones, I wondered if it would enhance 'infrared tones' as well. 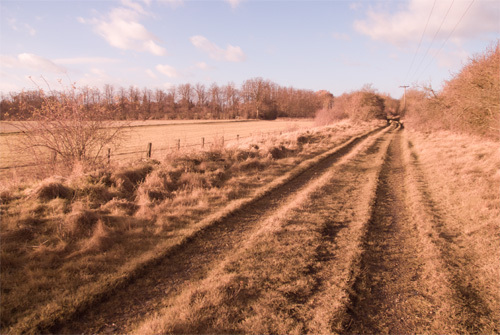 The polarizer seems to make a small difference to the white balance. 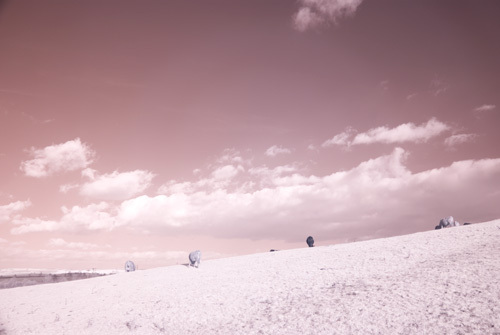 While it does darken the sky a bit, it is quite difficult to adjust correctly when shooting IR. 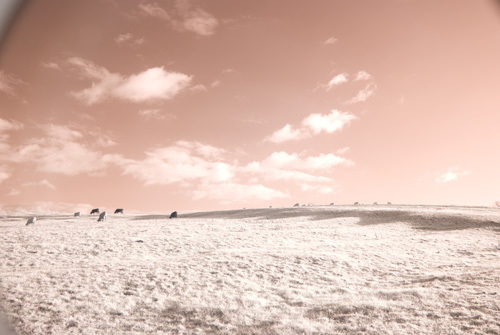 It doesn't seem to make much, if any difference to the clouds and landscape, at least in these test images. I was using the Nikon 18-70mm/3.5-4.5 lens for this test, which has a 67mm filter thread, then a 67-77mm step-up ring, then the polarizing filter, then the Cokin P slim* filter holder with the Infrared filter. The Redhancer filter was mounted using a 67-72mm step-up ring, the Redhancer, a 72-77mm step-up ring, and then the Cokin P slim* filter holder with the Infrared filter. *The filter holder is a Chinese Cokin P alike with the top 2 filter slots removed, essentially the same as a Cokin P slim filter holder. The filter holder can be seen at the edges of the images when used with the polarizer or Redhancer, which is not good. 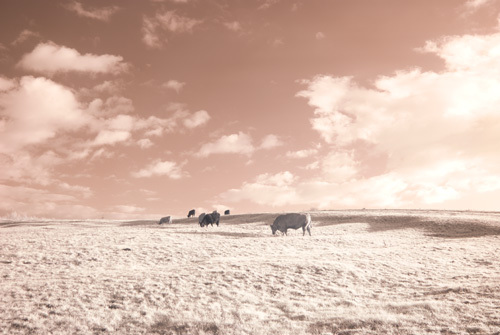 It seems to me that the polarizer and Redhancer offer no benefit when used in IR photography, while reducing the amount of light that reaches the sensor, and causing vignetting with my setup. I also noticed in these images a ring area of slightly lower contrast, lens-flare like effect. Whether this is down to the lens (an IR 'hotspot'), or the Infrared filter, I am not sure.